Visibility Creates Opportunity. So Why Aren’t Financial Advisors More Visible on Social Media? Financial advisors need to be active on social media in order to generate new opportunities. Simply having a financial advisor social media account isn’t enough. Communicating is the key to visibility and being found, and if you don’t do enough of it, you’ll essentially be invisible. 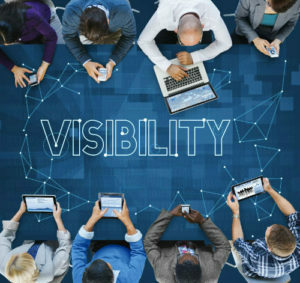 Since visibility on social media is so important for advisors, why don’t more of them strive for it? Here are some simple ideas to make yourself as visible as possible and create more opportunities as a result. People need to know what you’re an expert in before they will connect with you or follow you on social media. Writing original content to highlight your expertise is one of the best ways to do so. When it comes to financial advisors and social media, mixing in some originality with other outside credible articles shows you’re well-versed in your industry. When you share relevant articles on social media, you must ensure the article is from a credible source. Any user can tell a credible article from a phony one, so you could damage your credibility significantly if you share something that can’t be relied upon. On the other hand, sharing relevant and credible articles can indirectly highlight your expertise by showing you keep up with industry trends. The importance of social media for financial services goes beyond just posting articles. Connecting with people at different events can lead to different opportunities, so don’t hesitate to post about a particular event you’re attending. Doing this generates interest from your connections and will prompt them to check back to see how the event went, so be sure to follow-up on your experience. Interaction is another key to visibility when it comes to financial advisors and social media. People want to see who is interacting with their posts, so when you like and comment on their content, they will take notice. It may take a while before they start interacting and engaging with you, but if you are diligent and consistent enough, the relationship will start to develop. It’s always good to be involved in the community and to get others involved as well. Sharing posts on community involvement shouldn’t be seen as something you’re bragging about, rather, it should be viewed as bringing awareness for others to get involved. The more you’re involved, the more visibility you’ll ultimately create on social media. At SocialFinServ, we understand the challenges of financial advisor social media marketing, and we offer an all-in-one solution to reduce some of your burden and create more opportunities. Visibility is critical for the success of any type of social media marketing, so developing a complete strategy is important. Feel free to contact us to schedule a consultation to discuss your needs and to see how we can help you reach your goals as an advisor through social media.